Fun fact: I'm the Guinness World Record holder for Most Consecutive Days Writing A Song. I've just entered my 10th year of writing a song a day. All the songs live on YouTube. One of the promises of the blockchain is that it could fundamentally transform the way creators like me make a living. This project is a very personal exploration of that. - Grows by one each day, as long as I can keep the project going (read: Until I'm incapacitated or I die). - Each song is it's own discreet collectible, with a long list of attributes that make them all completely unique. Each illustration is comprised of a series of pieces that represent the attributes of that song. These pieces are then programmatically assembled to create unique images. Here are some attributes for year 1, illustrated by Steven Powell. My expression represents the mood of the song. There are 12 moods total in year 1 of Song A Day. My outfit represents the topic of the song. There are 33 topics total in year 1 of Song A Day. The instrument I'm holding represents the primary instrument. 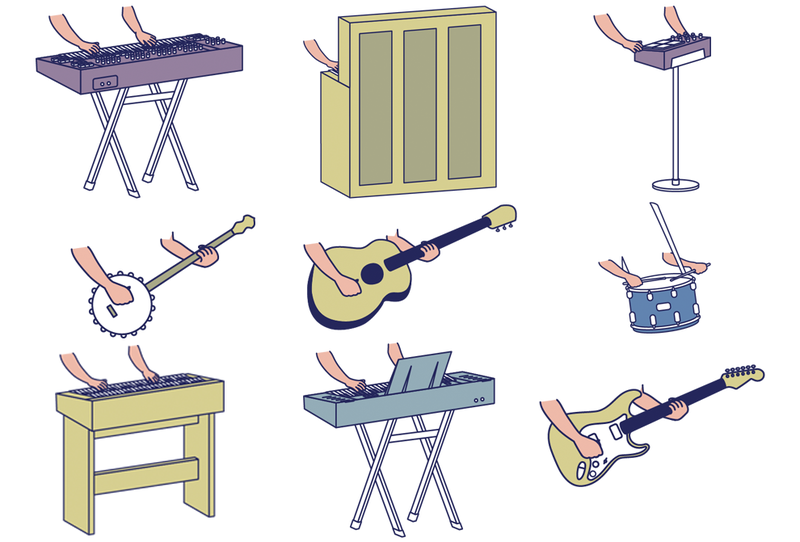 There are 15 instruments total in year 1 of Song A Day. The background represents the location where I wrote the song. There are 9 locations total in year 1 of Song A Day. I’m working with the folks at Pixura to get year 1 of Song A Day tokenized on the Ethereum blockchain. They’re going to integrate everything they’ve built for superrare.co directly into songaday.world. I'm looking to hire a different illustrator for each year of this project. Are you an illustrator who's interested in this project? Please get in touch! It's really expensive to develop a site as ambitious as this one. I've got to pay developers, designers and every illustrator. To raise the necessary funds, I'm offering these rewards. Think of it like a CryptoKickstarter. All the money you pay me will go towards making this project a reality. ANY AMOUNT - Donate anything and you get to choose a song to own (from a preset list) as soon as we launch. $200+ - Is there a song of mine that you know you've just got to have? Reserve it! $1000+ - I'll write you a custom song. Makes a great gift! $5000+ - I make my living making custom songs for companies. I can literally sing your white paper. Fill out the form below, send me the crypto, and I'll be in touch! NOTE: I'm happy to accept donations anonymously. Just donate in ETH or BTC below. ALSO: There's certain things I won't write about, like hatred or bigotry, so if your song idea is controversial, contact me before paying. What should the song be about? What song do you want to reserve?